All meetings, general session, meals and exhibits will be held in the Hyatt Regency New Orleans. Increase your exposure by positioning your brand image in front of over 2200 attendees throughout the facility. Excellent exposure in high traffic area. Your graphics will be big and bold! Size of graphic: 42" W x 96" H.
Design split graphic for one set of doors. Located in the main lobby, the hanging boards will give your company lots of exposure as everyone goes through the lobby multiple times a day-- checking in/out, sitting in the lobby or walking through the lobby to head outside. The flow of traffic is constant! Each banner is 3.0 'W x 15.0' H.
Gain lots of exposure with a captive audience as they ride the escalators to and from sessions and the exhibit hall. You may purchase multiple clings for a larger graphic that spans multiple glass panes. 15 clings available. Purchase 4 or more and receive a 10% discount. 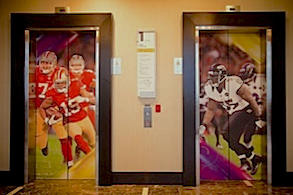 Excellent exposure with high traffic elevator doors. The flow of traffic is continuous throughout the day as these elevators carry people to the meeting space and their sleeping rooms. 2'x3' of your name/your message on the high traffic elevators. The ultimate in a captive audience. The natural response to an open elevator door is to look down before stepping in! On the busy second floor, just outside the Starbucks—need we say more about high traffic area!!! Place your message on a column in the area where people will pass every day for their coffee fix, to and from sessions and the exhibit hall. Purchase 2 sides or more and receive a 10% discount. High traffic area where many of the sessions will take place. On the same floor as the Empire Ballroom where general sessions will take place. Make a Big impression on attendees with your logo and message on the floor of the wide corridor leading to the session rooms. Graphic is 12' x 12'.